Yeah, but: I may get unusually excited by these things. The Long Version:Masking tape is a term that can include just about any moderately-sticky paper-based tape, but I'm sure that it conjures up exactly the same image for just about everyone: slightly shiny paper, about three-quarters of an inch wide, on a cardboard roll, cheap, and an aggressively nondescript light brown. 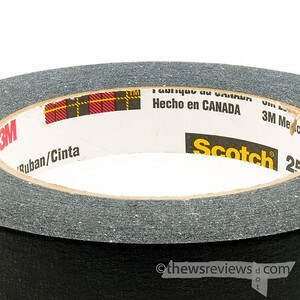 The Scotch® Sealer Tape 2510 made by 3M is exactly like that, except that it's black. Masking tape is duct tape for unhandy people. Neither are really used for their intended purposes, which they aren't even very good at, and their greatest attribute is that you already have it when you need something, anything, to do a job with. The jury's still out on whether it's more trailer to seal a cardboard box with duct or masking tape, but otherwise duct tape has a much better lobby group. Doing a google search on 'windows duct tape' brings up websites on terrorism and hurricanes. Sure, most of the advice is crap, but googling 'windows masking tape' gives less than half as many hits and they're about painting. How uncool is that? But this stuff is black. So even if it's still cheap and utilitarian, the unusual colour defrays some of the dweeb demerit points. (Like having an unusual colour of Crocs.) And masking tape is really good at some stuff, so there's always a reason to have it around. But my personal enthusiasm goes beyond simple novelty. As a photographer, I often shoot studio/still life shots of small items, and colour accuracy is very important. I can use black masking tape (or white tape, which I also have around here somewhere) without worrying about colour reflections. In my small lightbox black masking tape is an excellent lighting modifier all on its own, and I don't have to worry about it leaving residue behind. It's almost like having a low-tack gaffer tape. 3M is a massive company, and just searching for the number that's on the inside of the roll brought me to a page for red electrical tape. I eventually tracked it down to "Scotch® Sealer Tape 2510 Black", so that's a good place to start looking. Craft and office stores may have it in stock, or you can just save some time with the handy Amazon.com link which I'm shamelessly promoting.